Surface Dock instantly transforms your ultra portable Surface into a desktop PC. 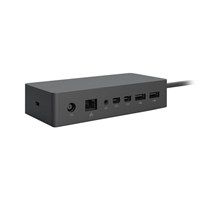 Simply plug in the SurfaceConnect cable to charge your device and access external monitors, a keyboard, mouse, and more. Find your perfect viewing angle, or position your device to take advantage of the robust pen capabilities. Surface Dock was built to boost your productivity.